A couple of weeks ago I packed up my kids toys. It's not the end of toy playing for them but the toys are going on an extended hiatus. It's not even the fact that in all the years they have had them, they've never cleaned them up, despite promises of rewards or threats of punishment. After all, we solved the "Lego underfoot" problems by giving the kids their own toy room which we can easily close the door on instead of cleaning. Nope, it's because both boys have entered a destructive phase which I remember from my own childhood. This advertisement for "battle damaged derby cars" which sounded incredibly cool. Of course, my parents had financial issues; dad was out of work and my mother hadn't worked since I was born. There was no chance of getting the cars and even if there were, I'd be waiting about 10 months until Christmas. The next week at school, my friend kept talking about how he was going to convert his matchbox (die cast metal) cars to be "battle-damaged" and then a day or two later he told me how great they turned out. I knew my friend was a pathological liar because he'd often tell unbelievable stories, like how he rode his bike faster than all the traffic but somehow I didn't think to question his honesty then. The next weekend, I took my suitcase full of precious matchbox cars into the garage, chose a couple of cars that I didn't love quite so much and I took to them with a hammer. I failed. They simply crushed and their wheels broke off. They didn't give the authentic "battle damaged" look I was after. I decided that it was something I had done wrong and gave it another shot with some different cars. I failed again. I tried over and over again, with the hammer, chisels, screwdrivers and all kinds of other things thinking that if my friend did it so easily, there must be a problem with me. Finally, only my very favourite cars remained. Everything else was destroyed. It was then that I snapped out of it and realised what I had done to my beloved toys. I knew that I had to get rid of them but I couldn't put them in the bin or my failure would be discovered. I decided to put them all down the drain in the street. So there it was that my parents found me crying and putting all my beloved cars down the drain. I never explained why, I simply didn't have the words to express it. I was disciplined and my parents never let me forget the incident but I didn't need disciplining. I needed understanding. My parents told everyone around me and many people said to me that I was wasteful and that if I didn't like my cars, I could have given them to their child. They never understood that I loved those cars and that there was a psychological reason for my actions. I held onto my last five cars until I had kids and I passed them onto my kids, who eventually broke them. I never played with them again though because just looking at them reminded me of one of the saddest days of my childhood. This all brings me back to the present. My kids love Lego. It's the most played with and most frequently requested of all their toys. Of course, being 10 and 13 now, they're starting to turn to other indoor pursuits like gaming and the internet. This means that the lego is being played with less and is being picked up even less than usual. About six months ago, I picked up all of the lego and noticed a disturbing trend. My kids had disassembled all of the lego people, lost most of the pieces and chewed many of the others. By disassembled, I mean down to the smallest pieces, detaching the arms from the shoulders and the hands from the arms so that they're no longer recognisable as "pieces of people". I reassembled the people again as best I could and told the kids not to do it again. 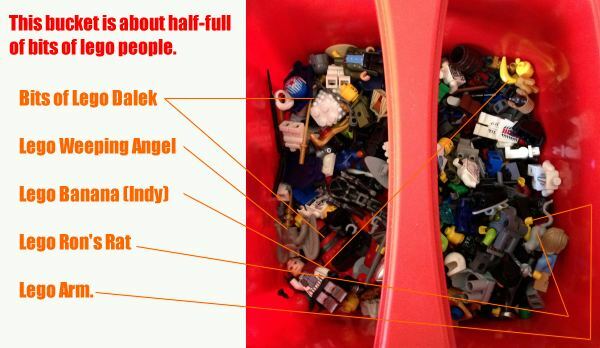 Adding, that if they did, I'd remove the lego for a long time. Recently we needed to make some changes around the house to make some more room, I decided to clean up the lego and to my horror, I found three intact figures. 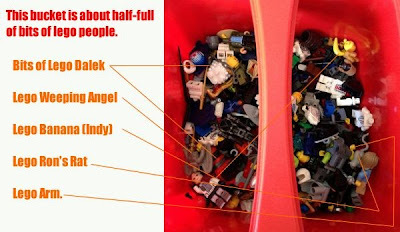 The rest I collected into a bucket (carefully separating their pieces from the rest of the lego - a process that took nearly three weekends on my knees). One day I'll work up the stamina to reassemble them. I've decided that my kids playtime has turned "bad" for the lego. I'll give them back in a year or so when they're older and more appreciative (and more responsible) but in the meantime, I'm doing things to protect them from themselves. I don't want them to look back and regret their mistakes like I did. I was late to realize that the Lego models, which had been painstakingly assembled by my son according to the instructions, were becoming broken and damaged and lost. I feel bad about it, because part of it was my fault - we moved from a rental to our dream house and had to move the assembled Legos somehow. I thought it would work to just crash them a bit into individual boxes. Unfortunately, the crashed models were then piled into a larger box when I wasn't paying attention and my son feels that it would be impossible to reassemble them. He was sad about it, and still brings it up sometimes. We all are faced with the prospect of thousands of Lego pieces, some of which are specialized, and no idea how to sort them in order to promote reassembly. DS has no interest in creative reassembly - if he can't follow the instructions exactly he doesn't want to do it. 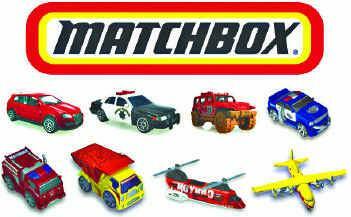 It's an ongoing issue, and I feel for you and your childhood realization re: Matchbox cars. I love Lego - it's an unalloyed good in the world. And I like your blog about living with Aspergers. My friend's young son Fynnjan has Aspergers and, long story short, has written the music and lyrics for a Christmas song called The Spirit of Christmas. It has been recorded as a single. We hope to get it to the top of the music charts (in the UK anyway) this Christmas. The money raised will go to the National Autistic Society with a small proportion going to support his local school's special needs team (the people who managed to get him to come out from under the table and socialise a little bit). We hope people will go to the website, register an interest and download copies from iTunes. It's all a massive leap of faith, but hey - it's fun too. May I offer an alternative perspective? I will note that I am not a parent, so I may be idealistic. This is part of what toys and childhood are for, learning about life while the consequences are lighter. Ideally there is someone to guide us through, but parents aren't perfect and don't always understand. From the perspective of a non-parent, this seems like a golden opportunity. This is a problem you know first hand! If you could turn back time, which would you rather have; your Hotwheels in mint condition or your parents understanding and support? Your writing makes it clear that it hurt to make that mistake and lose those cars, but the lack of understanding compounded the hurt. You may have already intended to do this but.... When it comes time to give the Legos back, some of them are going to be a loss. Be ready to talk them through it and hear their perspective, when and if they realize that loss. This is mostly a response to your last paragraph. You seem like a good parent and to have a good understanding of your kids. There are instruction booklets you can download from the Lego website or buy from ebay if that's a problem. If it's about the parts possibly missing, Lego stores and their website have individual pieces you can buy or get them from ebay. Sorting...start with piles of the more prominent pieces to get the huge pile to less visually right away (example: if there are 100 pieces of the 6 x 12 Lego "dotted planks" and a few pieces like wheels and bricks that are underneath them being hidden, start with the planks). then sort by size then color within that pile you created but keep them next to each other. This applies to all pieces. Technic pieces usually have holes in the bricks, so that will be easier to know the set where they belong. And don't be that parent that throws away Legos when you step on them. I was in my designated play area and mom walked through it, stepped on a Lego, got really mad, and threw it away. Very disappointing. I would mix my sets together but knew I had every piece from all of my sets...except that one. Lol It's not a big deal now that we can buy pieces online or at the lego store but those didn't exist when I was a kid.